Be part of a hive! Competing hives direct crazed worker bees as they scurry to pick up pollen in this colorful lawn game. Duration: This game is fast-moving and will allow for several rounds of play. Designers: Phoenix Perry and Marie Evelyn for Analogous Projects. Picky Sticky Pollen is an adaptation of Phoenix Perry's Honey, an interactive video game exploring issues of survival and the environment. Honey demonstrates even the smallest creatures' vital importance to their ecosystem as they struggle to survive in a unique fantasy-world. Players divide into teams of four. Each team chooses one player to serve as the Queen Bee. The lawn contains an assortment of pollen: RedPollen, YellowPollen, WhitePollen, and PurplePollen. A group of worker bees wander around the pollen-filled lawn according to one of three types of rules: "Pick up all"; "Scatter all"; or "Trade (thiscolor) for (thatcolor)". Each team collectively decides a set of commands for the worker bees to follow. The rules are shouted by the Queen Bee, and are carried out by the worker bees for twenty-second intervals. Each team has a total of five turns. The team whose PollenGoal most closely matches the worker bees' PollenCount (i.e., the amount of gathered RedPollen, YellowPollen, WhitePollen, and PurplePollen) at the end of the game wins! This game is fast-moving and will allow for several rounds of play. At the end of each round, the winning team will be awarded a prize or prizes. However, ALL players are encouraged to bring screen-printable items -- such as t-shirts, pillowcases, bags, and et cetera -- which will be screen-printed for free while you play. Hooray! Complexity theory is not new to art or to our culture. It migrated from computer science and biology to economics and art and, with the advent of the world wide web, it invaded our collective subconscious. Analogous seeks to support complexity-driven art and artists playing under this conceptual umbrella of "Interaction Art". Progress occurs by metaphor and analogy: Their hope is (by bringing together people and projects irrespective of media and genre) to enable philosophical crosstalk. Analogous events and performances have been reviewed in The Wire, Make Magazine, Time Out New York, and The Village Voice. They received a Village Voice Best-of-NYC Award in October 2008 for "Best Arts Organization Centered Around Recycling". For more information about Analogous and current Analogous projects, visit AnalogousProjects.org. Artist Phoenix Perry has a decade of experience in the area of Art and Technology. From working in San Francisco in the 90's as a digital arts curator and educator to creating the award winning ongoing DVD project Reline, she has extensive experience in new media, technology and user interfaces. Her own motion graphic video works have screened worldwide including venues such as Lincoln Center, SFMoma, The Guggenheim, Transmediale, Yerba Buena Center for the Arts, LAMCA, European Media Arts Festive, GenArt, The Seoul Film Festival and many others. 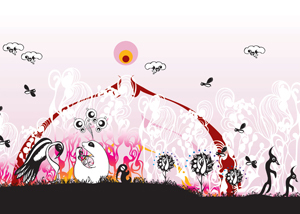 Her work explores gaming, environment, complexity, and technology.